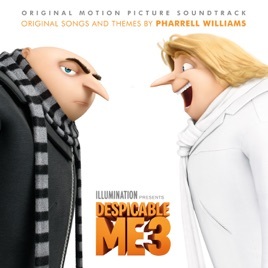 Just as he’s done on previous Despicable Me movies, Pharrell lights up the scenery with his signature neon sound. He lets his cherry falsetto carry “There’s Something Special.” The fluorescent exuberance of “Happy” can be heard on “Hug Me” (with South Park’s Trey Parker) and “Yellow Light.” Sprinkled between these space-age fun tracks are classic ‘80s hits by Michael Jackson, Madonna, Nena, and a-ha. And, if you speak fluent Minion, “Malatikalano Polatina,” “Papa Mama Loca Pipa,” and “Tiki Tiki Babeloo” are must-listens.